Website downtime alerts and uptime monitoring in United States and across the world. Downtime notifications to email, SMS and Slack. Response time monitoring, uptime stats and downtime logs. Up to 60 websites monitored completely free. Websites checked every minute or every 3 minutes. View monitors in real time: see all your websites at a glance or view individual websites. Add monitors individually or upload websites in bulk - start monitoring in seconds. Downtime alerts via email, Slack and SMS. Receive alerts the instant a website is detected down, or... set custom alerts so that notifications are only sent if a site stays down for a time. Rate limit alerts by setting the maximum number of downtime alerts that can be sent per hour. Keep track of website speed by monitoring response time. The time for the web server to respond is recorded every time an uptime check is made. View graphs of individual response times for 24 hours, hourly average response times for 7 days, and daily average response times for 2 years. View the uptime statistics for every website that you monitor. 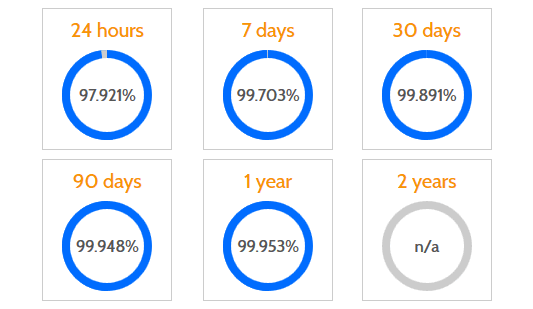 See uptime stats for 24 hours, 7 days, 30 days, 90 days, 1 year and 2 years at a glance. Access downtime records of individual downtimes for up to 2 years. Downtime records include the timestamp, the duration of downtime, the response code from the server and a short explanation to help you troubleshoot the problem. With our free account you can monitor up to 60 websites and each website is checked every 3 minutes. It's completely free so why not start now - you'll be up and running in less than a minute!